I grabbed my americano from the Frontside Grind this morning, something I treat myself to once or twice a week depending on the work load and the fog thickness in the brain. I strolled across the street to IME to shop talk and update Rick & Celia Wilcox about the intense experience of being at Cap Trinite under a boulder during Irene on the night of our first wedding anniversary with three of my closest friends and of course, my hot hubby. With being there a week prior, and no cell service, we had no idea Miss Irene was coming our way. 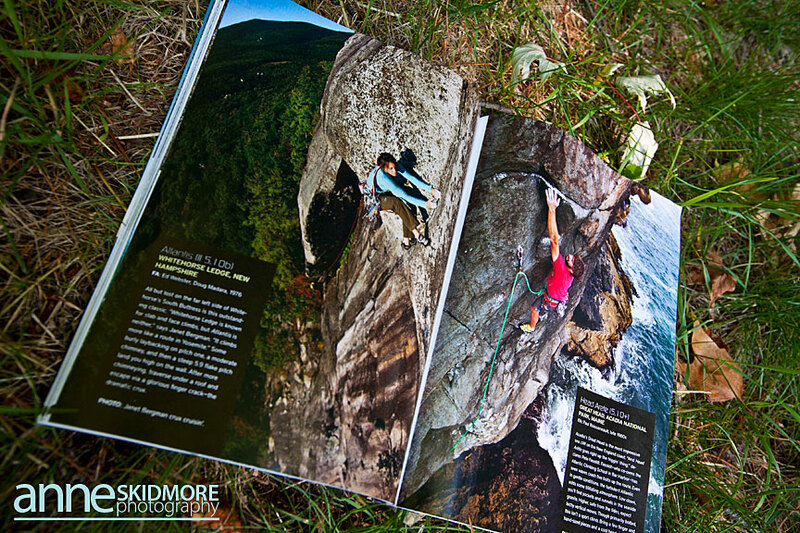 While filling them in on the “Saranne Wrap Bivy”, I noticed the latest Climbing Magazine was on the counter. For the past year Pat Bagley and myself zoomed up down and all around New England to scope out some fresh New England’s 5.10 gems. That being said, this piece took awhile to put together and it was really fun to see it in print this morning. While I was photographing and checking out cliffs in Vermont, Connecticut, Massachusetts, New Hampshire, and Maine I realized how fun it was to zoom around to all these random cliffs I had never taken the time to explore. As though I had almost forgotten that adventures can exist right in your backyard. I’m not talking big wall/Himalayan (or even Cap Trinite?) adventures, I’m simply talking about going out to a new place and new rock that is out of the normal box for you. We all get so settled into routine and convenience wherever we call “home”, and it’s totally understandable. 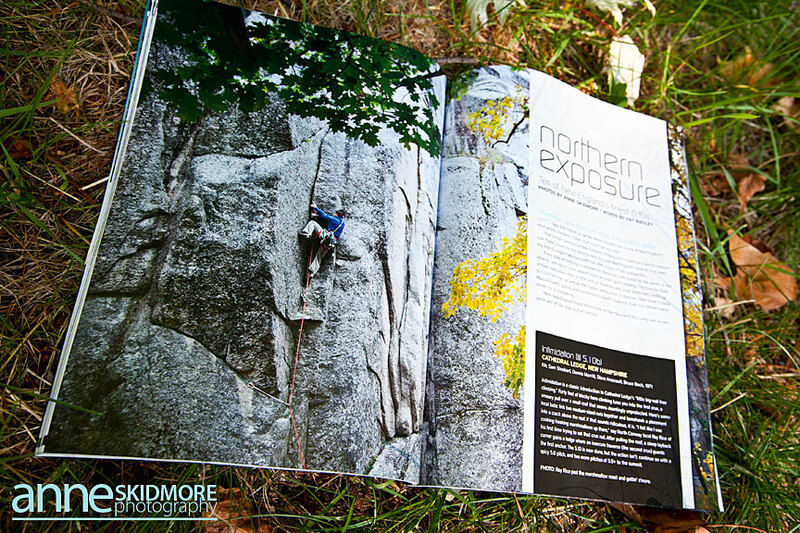 However, I hope this article inspires some to get out of their normal routine bubble and it brings some fresh air to your climbing world. 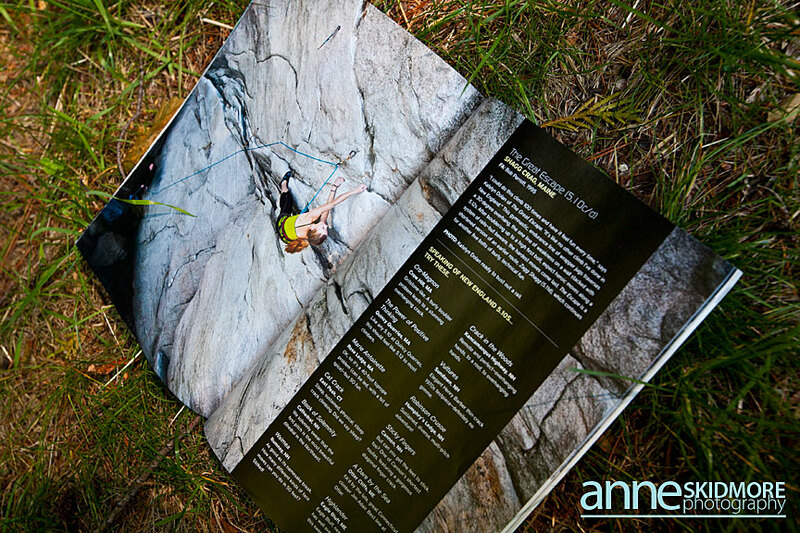 Here is a sneak peek of some of the imagery from the 8 page photo spread in the October issue of Climbing Magazine. You’ll have to pick one up to check the rest out! A lil’ special thanks to all those who climbed, belayed or helped in some way. It doesn’t happen without y’all: Pat Bagley, Janet Bergman, Kayte Knower, Jay Knower, Kevin Mahoney, Sam Bendroth, Emilie Drinkwater, Pete Fasoldt, Eli Simon, Jon LaValley, Bayard Russell, Pat McElaney, Katelyn Dolan, Jessa Hobson, and Ray Rice. Also a big thank you to Sterling Rope for their support and providing hot ropes throughout this project.